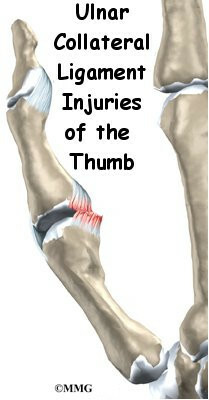 Injury to the ulnar collateral ligament of the thumb is fairly common. This strong band of tissue is attached to the middle joint of the thumb, the joint next to the web space of the thumb. This condition is sometimes called gamekeeper's thumb because Scottish gamekeepers commonly injured their thumbs as a result of their job. The joint that is affected is called the metacarpophalangeal joint, or MCP joint. Any hard force on the thumb that pulls the thumb away from the hand (called a valgus force) can cause damage to the ulnar collateral ligaments. 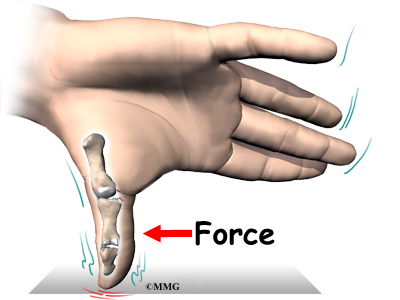 When the thumb is straight, the collateral ligaments are tight and stabilize the joint against valgus force. If the force is too strong, the ligaments can tear. They may even tear completely. A complete tear is also called a rupture. When the collateral ligaments actually tear, the MCP joint becomes very unstable. It is especially unstable when the thumb is bent back. If one of the ligaments pulls away from the bone and folds backwards, it won't be able to heal in the correct position. When this happens, surgery is needed to fix the ligament. Sometimes the ligament itself will not tear but instead pulls a small piece of bone off the base of the thumb where it attaches. This is called an avulsion fracture. This can also lead to an unstable thumb joint if the fracture does not heal correctly. In Scottish gamekeepers, ligament damage in the MCP joint happened because the ligament stretched out after the gamekeepers repeated the same action over and over. Today, most cases of ligament damage in the MCP joint are caused from sports injuries. Now doctors tend to refer to the condition as skier's thumb, since it happens so often in downhill ski accidents. Any extreme force that pulls the thumb away from the palm of the hand can damage the ligaments. The most common way for this to happen is to fall on your hand with your thumb stretched out. When a skier falls down while holding a ski pole, the thumb may get bent out and back, leading to an injury in the ulnar collateral ligament of the thumb. What does an injured ulnar collateral ligament of the thumb feel like? When the ulnar collateral ligament of the thumb is injured, the MCP joint becomes painful and swollen, and the thumb feels weak when you pinch or grasp. You may see bruise-like discolorations on the skin around the joint. The loose end of the torn ligament may form a bump that can be felt along the edge of the thumb near the palm of the hand. A torn ligament makes it difficult to hold or squeeze things between your thumb and index finger. Your doctor will ask you to describe your injury and symptoms. Your doctor will also do a complete physical exam of both thumbs and hands. You will need to have X-rays or other imaging tests. X-rays are required to see if there is an associated avulsion fracture, since this may change the recommended treatment. X-rays cannot show all types of damage to ligaments. For example, an X-ray of your thumb can look perfectly normal, even if the ulnar collateral ligament is partially or completely torn. To check the ligament, your doctor will perform a valgus stress test. This involves pushing your thumb backwards and out in different positions. Valgus tests can be painful, so you may be given a local anesthetic before being tested. The stress test is done to determine how stable your joint is. If your joint holds steady, the ligaments may only have been strained or partially torn. If your joint is loose and unstable, your ligaments have probably completely ruptured. Your doctor may do the stress test at the same time your thumb is being X-rayed. The X-ray image shows how unstable the joint is when it is stressed. The MCP joint needs to be stable for the thumb to be strong enough to grasp objects. The goal of treatment is to help the ligaments heal so that the thumb can be restored to full function. If the thumb ligaments are only partially torn, they usually heal without surgery. Your thumb will be immobilized for four to six weeks in a special cast, called a thumb spica cast. After that, you will begin to do exercises to regain your range of motion and to strengthen your grip. Getting treatment soon after an injury to the ulnar collateral ligament of the thumb may improve your ability to regain strength and range of motion. If the ligaments are completely torn, you will most likely have surgery to repair them. A torn ligament cannot fully heal itself. Surgery for the thumb collateral ligaments is usually done as an outpatient procedure, meaning you will probably go home the same day as the surgery. In the surgery, your surgeon will make a small V- or S-shaped cut over the back of the MCP joint of the thumb. This helps isolate and protect the nerve branches running up your thumb. Your surgeon will then cut through a sheet of tissue called the adductor aponeurosis. This helps expose the MCP joint and the ligaments. The area around the injury is examined for any soft tissue damage. Your surgeon then repairs the ligaments with stitches that anchor them back to the bone. Patients usually have good results when suture repair is done within four weeks after the injury. After surgery, pain and stiffness are usually minimal, and thumb strength will normally return. In some patients, the MCP joint continues to be unstable. The joint feels painful when pinching or grasping and is generally weak. Most of the time, chronic instability tends to happen when the patient doesn't get treatment or when a doctor wasn't aware of a ruptured tendon. However, even when skilled surgery is performed, the thumb sometimes ends up being chronically unstable. A thumb that is loose and unstable will eventually develop arthritis. Some surgeons have had success by grafting in new tissue to reconstruct the ligaments. When the ligament has been unstable for a long time, surgery may be needed to keep the MCP joint from moving. This type of surgery is called fusion. A fusion procedure is often the best choice when a patient's job involves heavy labor that would continue to put too much strain on his or her unstable thumb joint. When the joint is fused together, a person's ability to do day-to-day tasks isn't affected that much. This is because some people have a very small range of motion in the MCP joint anyway. Fusion keeps the joint from moving, but it also protects it from eventually becoming arthritic and painful. Surgery does carry some risks. In rare cases, some of the small nerves to the skin on the back of the thumb may be damaged during surgery. This may cause numbness on the back of the thumb. When this happens, it usually gets better on its own. Sometimes the MCP and other thumb joints become stiff. Physical or occupational therapy treatments are helpful for easing the stiffness and helping you regain thumb movement. Patients who are treated nonsurgically with a thumb spica cast start an exercise program when the cast is removed, usually after four to six weeks. Motion and strength usually improve within another two to four weeks, allowing people to get back to normal activity. You will be placed in a thumb spica cast after surgery for four weeks. Some surgeons will take the spica cast off at four weeks and then place your thumb in an immobilizing splint for another two weeks. Some patients work with a physical or occupational therapist to help regain range of motion and strength in the thumb. Most patients are able to return to normal activity three months after their surgery.